Exeter head coach Rob Baxter believes the Premiership side's form was pivotal in having three players included in England's Six Nations squad. Sam Hill, who replaced injured Exeter man Henry Slade, Luke Cowan-Dickie, and Jack Nowell were picked. "We are delighted to have them involved," Baxter told BBC Radio Devon. "It shows if you get to the right end of the table, the players play well for you and you get on form as a side and individuals, you get recognition." Having impressed early on in the season, as Exeter won six of their first seven league matches, Cowan-Dickie (broken thumb),David Ewers (knee) and Slade (broken leg) all found themselves on the injury list. However, Baxter praised England boss Jones for picking the players based on their performances over the previous months, with it being confirmed that Ewers and Slade would have both been selected had they been fit. 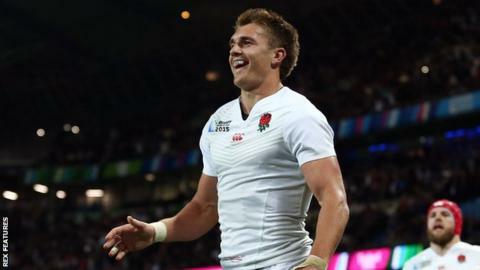 "From my prospective I am really pleased Eddie Jones seems to have believed what he had seen with his own eyes," he said. "Dave, Luke and Henry have been injured for a little while now but he's believed in the form they showed at the beginning of the season when there was no doubt that they were three of the form players of the competition. "There is so much in the press about who was good that weekend, whereas what I feel those three guys in particular have shown is real quality over the early period of the season." Meanwhile, Nowell's injury, which he picked up in the victory against Gloucester on Saturday, is not as bad as initially feared. "It looks like a little bit of bone bruising and initial scans have shown there is no significant ligament damage," Baxter confirmed. "It's about resting him up, keeping him off feet for a little while and letting the knee joint settle down. "We're hopeful that won't take more than a couple of weeks and there will be potential for him to take part in the whole of the Six Nations."